I am not a procrastinator (yes, I am). I call the doctor when I get sick (only after putting up with the ailment for at least a week and a half). I fix things around the house (once there is impending danger to the structure itself). I'll buy a bigger car for my growing family (once I get frustrated enough with all the stuff I can't fit in the current one). I will write a Peter Sis birthday blog post (after spending all afternoon focusing on an activity for one book, and not reading the other books I need to). I am coming clean. I avoid situations that make me anxious or could be potentially difficult. I had a boss once write in an evaluation that I was poor at time management and that upset me. I was able to manage my time. She didn't get my decisions and I had different priorities than she did. I have always felt I can get an enormous amount of things completed in a day's work. However, I just put off the things that are a little tougher. Luckily, I know how long I can wait until I have to get moving and address the situation. This week I waited until the last minute to read all the books I got at the library by Peter Sis because I was little nervous to write about them. The topics of his books are different than many of the other picture books that I have read. Peter Sis was born in Czechoslovakia, grew up loving to draw and came to the United States to work on an animated film for the 1984 Summer Olympics in Los Angeles. His project was canceled when the Eastern Bloc boycotted the games. He worked some magic and was able to stay in the country. 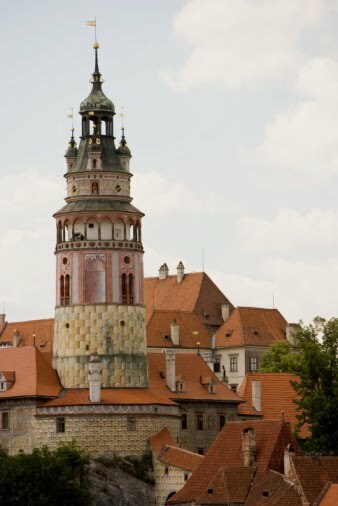 While staying in the country, he met author, Maurice Sendak, and was introduced to the field of children's literature. However, he was drawn to the field of film making which was how his father made his living. So, he decided to try his hand at children's literature, because he knew he could always turn the book into an animated film at a later date. As an illustrator, he successfully developed his own unique and complex style. Although he had many "nay-sayers" critique his work, it didn't take long for this style to get noticed by the children's literature community. He illustrated the Newbery Medal winning book, The Whipping Boy , by Sid Fleischman in 1986. Later, he won Caldecott Honors for three books with Starry Messenger (1997), Tibet Through the Red Box (1999), and The Wall: Growing Up Behind the Iron Curtain (2008). Additionally, he was awarded the MacArthur Fellowship in 2003. I separated the Peter Sis books I selected at the library this week into two groups. Peter Sis would probably split his books into groups too; books before children, books created and inspired by his growing children while they were young and then books that he wrote for himself after his children had grown. I separated the Peter Sis books into "books to read with my kids" (Ship Ahoy , Madlenka , Play, Mozart, Play , The Train of States ) and another group was "books to read by myself" (The Wall: Growing Up Behind the Iron Curtain, The Three Golden Keys , and A Small Tall Tale from the Far Far North ). I did this because some of his books have complicated themes. I spent last night staying up late reading Peter Sis books by myself. By far, The Wall was my favorite, yet all three were great. This book provided a perspective of growing up in a Communist country during the Cold War. It discussed emotions such as fear and sadness, and feelings of repression mixed with tinges of hope. These feelings were cast by a controlling system of government and an unknown future that was clouded by distrust. The illustrations in this book are outstanding, which is to be expected from Sis. His use of color throughout the book is carefully placed to give additional meaning. I am not a reader of novels for many reasons. However, these picture books by Sis felt very much like novels because of the depth of emotion. I singled out The Train of States immediately when I gathered books at the library. In this book each page is a train car that represents a different state in the USA in the order of their adoption into the union. The illustrations of the train cars include facts about each state including state symbols, landmarks, and famous people. Just looking at the book was enjoyable for me because there were many things to look at on each page. However, I wanted to make it more interactive for my daughter. I developed a states matching game that you can download, print, and play. 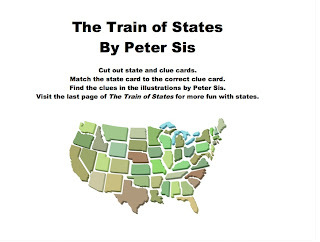 The game is based upon the book, therefore the book will help you to match the state cards to their clue cards. However, all the information can be found on the internet through a basic search, so this game can be used without the book. I can envision this game as a learning center in many classrooms or for homeschooling parents. Many of my readers have mentioned that they love reading poetry to their children. Peter Sis has illustrated many poetry books for the renowned poet, Jack Prelutsky. Check out - Scranimals , The Dragons are Singing Tonight , The Gargoyle on the Roof , and Monday's Troll . If your kids like strange creatures, witches, trolls, and goblins these poetry books might be right for them! Preparing for this post reminded me of the time I spent writing about Uri Shulevitz. It was time consuming and required me to move out of my comfort zone. I procrastinated then just like I did this week because I was nervous about trying something new. In the end, everything turned out fine, just like it always does! Click here to download this week's Library Checklist!